Discounts are available for 2'-F-G! 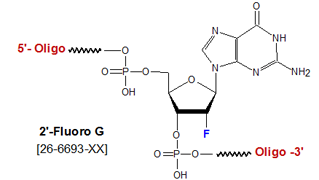 2'-Fluoro-deoxyguanosine (2'-F-G) is classified as a 2'-Fluoro RNA monomer. The substitution of a highly electronegative fluorine atom for the 2'-OH group of the ribose results in the ring of a 2'-F-ribonucleoside having a C3'-endo (i.e., RNA-type) conformation. Consequently, an RNA oligonucleotide containing a 2'-F RNA monomer adopts the more thermodynamically stable A-form helix on hybridization to a target (1). (a) Anti-sense oligos & Nuclease Resistance: When 2'-F RNA is incorporated into an anti-sense DNA oligo (resulting in a 2'-F RNA/DNA chimeric), the Tm of its duplex with RNA increases relative to that formed by an unmodified anti-sense DNA oligo by 1.8�C per 2'-F RNA residue added (1). The DNA/RNA duplex formed between a chimeric 2'-F-RNA/DNA anti-sense oligo and its RNA target also is a substrate for RNase H. With respect to nuclease resistance, while 2'-F RNA nucleotides do provide some nuclease resistance when incorporated into DNA, phosphorothiolation of the 2'-F RNA phosphodiester linkages is recommended, because it strongly enhances such resistance. This effect becomes particularly important if the 2'-F RNA nucleotide is to be incorporated at one or more of the first three positions of the 5'- or 3'-ends of the oligo. (b) Aptamers: The addition of 2'-F pyrimidines (C, U) into RNA aptamers has been shown to provide them with both considerably increased nuclease resistance and equal or higher binding affinity for their ligands, compared to the corresponding unmodified aptamers (2,3). The incorporation of 2'-F RNA nucleotides into RNA aptamers as an optimization strategy is becoming an increasingly common practice. (c)	siRNA & Nuclease Resistance: siRNA synthesized with 2'-F pyrimidines have been shown to have greatly increased stability in plasma compared to 2'-OH siRNA (4,5). In one study, levels of inhibition for 2'-F siRNA and 2'-OH siRNA, in cell culture and in vivo using BALB/c mice transfected with pGL3 luciferase, were similar over time (4). In another study, siRNA fully substituted with both 2'-F RNA and 2'-O-Methyl RNA nucleotides displayed not only enhanced stability in plasma, but also >500-fold increase in capability to down-regulate gene expression compared with the corresponding unmodified siRNA (5). (d)	LNA Alternative: The increased thermal stability and nuclease resistance provided by 2'-F RNA residues make them attractive as lower-cost substitutes in any application involving LNA-modified oligos. 1. Kawasaki, A.M., et al., Uniformly modified 2'-deoxy-2'-fluoro phosphorothioate oligonucleotides as nuclease resistant antisense compounds with high affinity and specificity for RNA targets, Journal of Medicinal Chemistry (1993), 36: 831-841. 2. Khati, M.; Schuman, M.; Ibrahim, J.; Sattentau, Q.; Gordon, S.; James, W. Neutralization of infectivity of diverse R5 clinical isolates of human immunodeficiency virus type 1 by gp120-binding 2'F-RNA aptamers. J Virol, (2003). 77: 2692-8. 3. Goringer, H.U. ; Adler, Annette; Forster, Nicole; Homann, Matthias. Post-SELEX Chemical Optimization of a Trypanosome-Specific RNA Aptamer. Combinatorial Chemistry & High Throughput Screening (2008), 11: 16-23. 4. Layzer, J.M. ; McCaffrey, A.P. ; Tanner, A.K. ; Huang, Z.; Kay, M.A. ; Sullenger, B.A. In vivo activity of nuclease-resistant siRNAs. RNA (2004), 10, 766-71. 5. Allerson, C.R. ; et al. Fully 2'-modified oligonucleotide duplexes with improved in vitro potency and stability compared to unmodified small interfering RNA. Journal of Medicinal Chemistry (2005), 48: 901-904.